The main objective of this research is to optimize pain treatment with patients with occupation-conditioned diseases of the locomotor system (LMS) and the peripheral nervous system (PNS). The subject of this research are 58 people working in clothing industry, residents of the regions of Pleven, Lovetch, Veliko Turnovo and Gabrovo. The patients of this research were hospitalized in the Department of Occupational Diseases, UMHAT “Dr. Georgi Stranski”- Pleven, during the period 2014-2016. Distribution according to age: from 23 to 62, average age 46,7 years (Figure 1). Distribution according to years of working experience in the clothing industry (Figure 2). 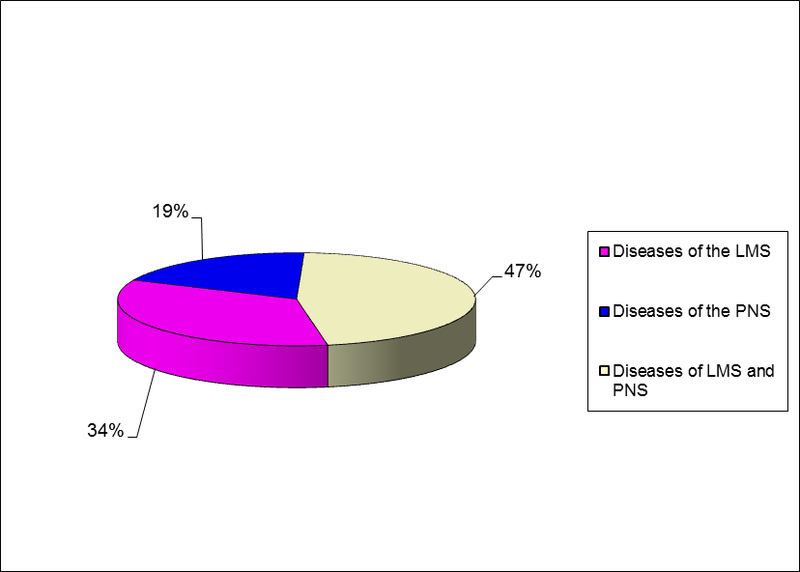 Distribution according to diseases (Figure 3). 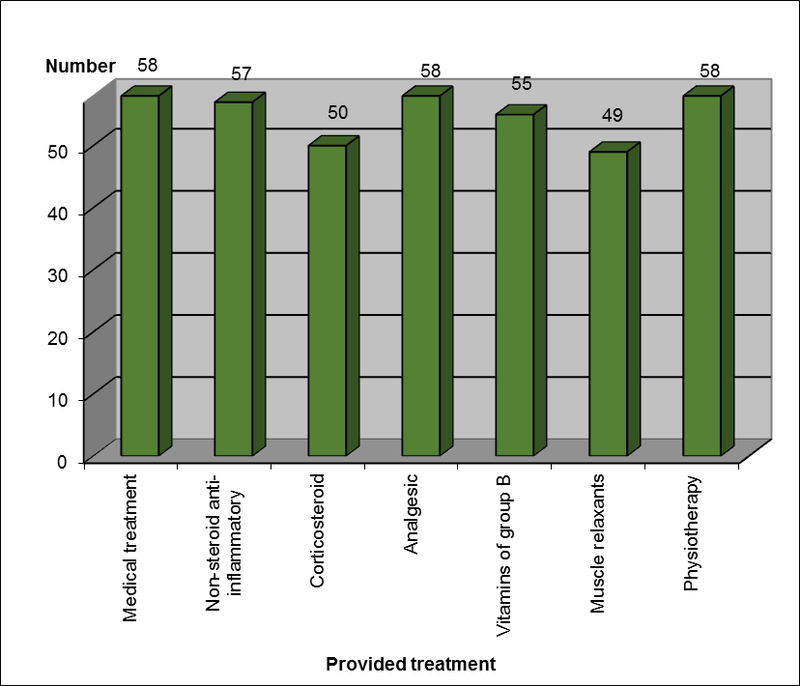 It was provided a complex integrated medical treatment and physiotherapy (Figure 4). The average period of hospitalization is 6 days. Upon receiving and discharge of patients clinical examination and direct individual survey were conducted. 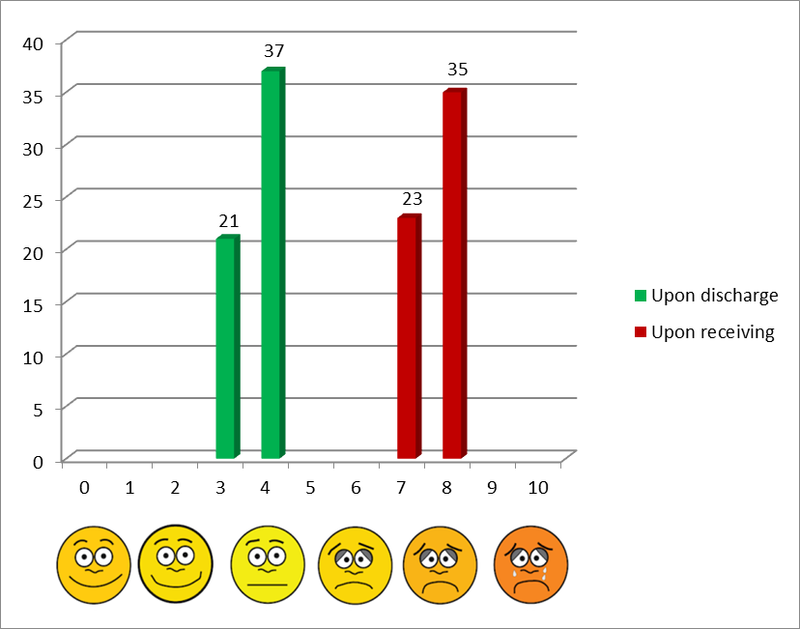 Intensity of pain by VAS is shown in Figure 5. 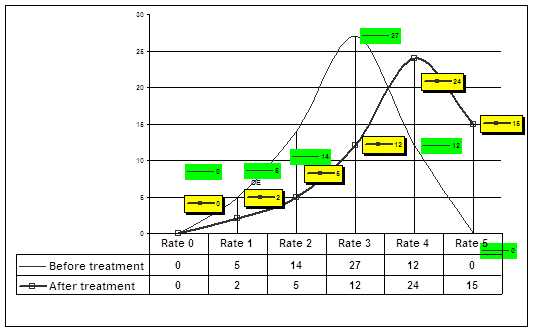 Figure 6 shows the curve of the Wilcoxon for the averages of test DLA at the beginning and at the end of the treatment process. The good results of the test for DLA in the reference period, the formation of a peak and displacement on the curve of Wilcoxon to the right reflect significant better performance status of treated patients and improving the quality of their daily lives. — Pain is a major and important event of work-related diseases of the LMS and the PNS. — Integrated medication and physiotherapy successfully influence pain, improves functional status of patients and increase their quality of life. Birse T. M., Lander J. Prevalence of chronic pain. Can J Public Health, 1998 Mar-Apr; 89(2), pp. 129-131. Buckle P. Upper limb disorders and work: the importance of physical and psychosocial factors. J Psychosom Res., 1997 Jul; 43(1), pp. 17-25. Foley K. M. Acute and chronic cancer pain syndromes. In Oxford Textbook of Palliative Medicine, 3rd edn, eds. D. Doyle, G. Hanks, N.I. Cherny, and K. Calman. New York: Oxford University Press, 2004, pp. 298–316. Rashkov R., Sheitanov Y. Practical Guide in Rheumatology [in Bulgarian]. S. CIM, 2001, pp. 58-60. 5. Simeonova J., Velkova A., Tsvetkova S., Kostadinova P., Kamburova M., Georgieva S. Self-rated health, health behavior, perceived illness vulnerability, perceived controllability over health among ambulatory and hospitalized patients over 44 years of old [in Bulgarian]. Science & Technology, 2014, 4(1), pp. 250-255. Simeonova Y., Velkova A., Tsvetkova S., Kostadinova P. The meaning and dimensions of health self-assessment in individuals over the age of 18 [in Bulgarian]. Health policy and management, 2014, 14(2), pp. 49-55. Pain is an unpleasant sensory and emotional experience, associated with present or potential tissue damage. Chronic work related syndrome is typical of many injuries to bones, joints, muscles and peripheral nerves. The aim of the study is to optimize the treatment of pain in patients with work related diseases of the bones-joints and peripheral nervous system. The subject is 58 people hospitalized in the Department of Occupational Diseases, University Hospital – Pleven in 2014-2016. Clinical, laboratory, electrophysiological and imaging diagnostic methods are used. Conclusions are made and given recommendations for optimizing the treatment of pain in work related dis-eases.